“I am a British artist living in Dubai. My daily practice is observational drawing. I have a ‘warts and all’ appreciation of the city, landscape, flora and fauna around me. I draw mostly from life, mostly graphite pencil, but also pen and ink, watercolour, and linocut. 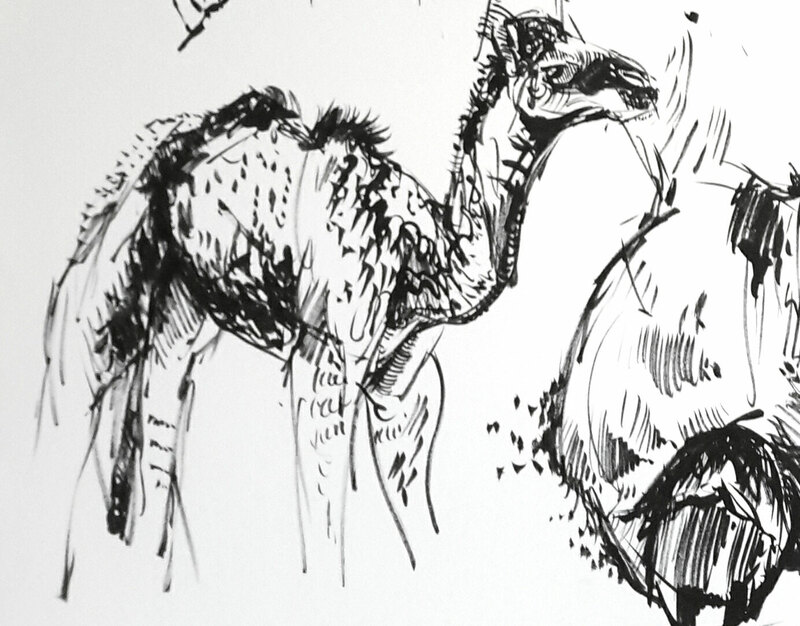 I visit a local camel farm to sketch and take reference photos. “I’m so in love with these camels, even though you’ve been working from photos you’ve made them look very life like. The awkwardness of their positioning and the way that they look down with their half-lidded eyes, they look like characters. It looks really real. The brush pen seems to suit you. You’ve done a fine job of dictating the flow of the fur around the eyes and the neck, but my favorite part is when you trail off around the base of the neck and only use a couple thick lines to show the body. I think getting a few more brush pens of different sizes and working with these contrasts of high detail and tiny lines, and less detail and thick lines, would be really beautiful. 9 responses on "Gail Reid"
Hello! I just want to say that I think your drawings are very lovely! I agree with what everyone has said, and I’m excited to read that you will be drawing more animals in the future. One thing I’d like to recommend that would be fun as a warm up to drawing more animals would be to make some gesture drawings from observation. Gesture drawings are sketches that focus more on capturing the movement of a person/animal quickly with broad, quick strokes. I don’t know how fast camels or the other animals you’re planning on drawing are, but I know that for faster-paced animals, like birds, this can be handy! I’m loving these pieces! There is a ton of energy in all of your marks, which is something that really takes a sketch to the next level for me. 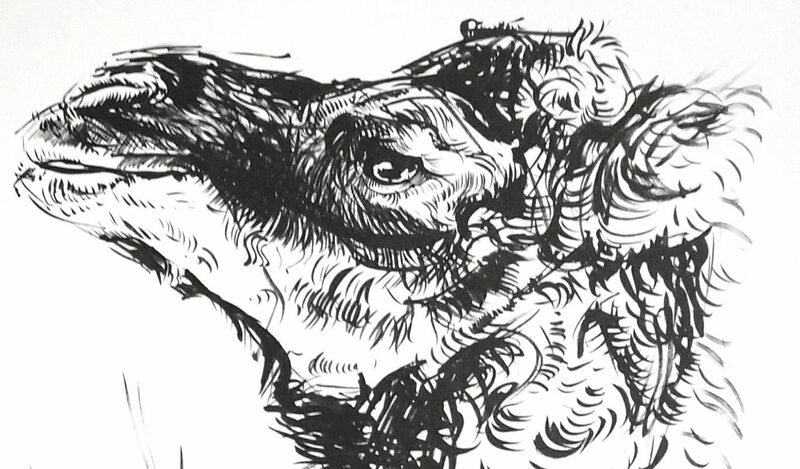 Your intention to explore your mark-making abilities with the brush pen is very successfully achieved in my opinion. I think experimenting with new media/tools is always a rewarding and valuable exercise– and this is no exception, clearly! I really appreciate the “warts and all” approach to your home and your art that you mention in your artist statement. Staying within that vein, I would definitely recommend going to the farm with your sketchbook, not only your camera, if you were to continue with this piece. 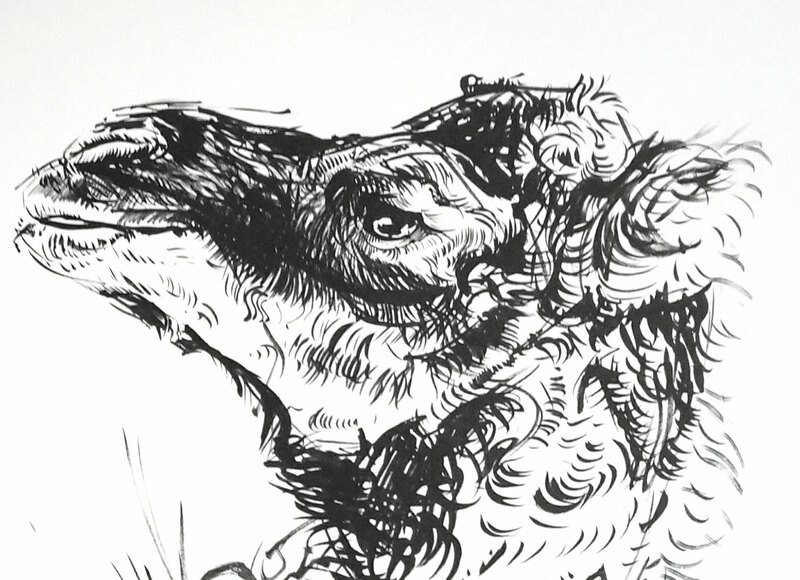 Sketching a creature or landscape that is constantly moving and changing can be a really great way to build confidence in your pen marks. I love reference photos (especially ones you take yourself), but I do think a certain amount of preoccupation with replicating the image comes along with them. So, drawing observationally here could be a nice way to let go, get lost in the marks, and let the experience of being at the farm seep in your work even more! Overall, awesome job. I really enjoyed looking at your work and good luck with future drawings of your beautifully imperfect surroundings! I’ve got to agree with everyone on the skill, confidence, and diversity of your marks — they do a fantastic job of conveying the different textures of the camels, especially on the large head, where the waves and swirls of hair are really well-executed. One thing I’d suggest when making pages like these is really considering composition beforehand. Even though they’re just studies, planned placement of the drawings can really elevate the quality of the piece. For example, if the large hoof were a little farther down, it might give the beautiful ruffles on the neck of the big head more room to breathe, like the sketches in the upper left-hand corner have. Alternately, overlapping the drawings could be visually exciting! Overall, these are great. The personality and confidence in your drawings is very impressive! I honestly can’t believe you got such an excellent range of marks from a single brush pen! Lauryn already mentions in her critique that you should try using different sized pens together, but I would also suggest using different colors! You include such lovely hatching in the portrait of the camel that I would think you could do a lot by layering different colors. Thank you so much Lauryn for your insightful and helpful crit. This has really got me thinking about using different tools, and levels of abstraction – Hokusai is fantastic, and absolutely resonates with me – I also work in relief reduction printmaking, but there is a big capability gap to cross!.Thank you for the pointer. Clara and Deepti thank you so much for your additional help, I sketch camels from life occasionally when possible, and completely agree with you,..I have just had my first solo show here, featuring portraits, shrimps and cockroaches all observed from life. That is absolutely the best, freshest, and most sincere way to connect with your subject. Sadly, it’s 40+ degrees here now, which is fine for camels, but not so fine for my English Lightweight constitution! We are leaving Dubai soon, so I will shortly substitute camels for UK native creatures – all your sterling advice and suggestions hold, regardless of subject. Chuffed to have my work featured on Artprof, thank you all for your time and interest. I hope not too creepy to say I absolutely love artprof, and have recommended it to friends – such a great idea, and a genuine, generous contribution to art education. Glad to hear the feedback was helpful Gail! We love your work and are so pleased to feature your sketch here. Thanks so much for your support and enthusiasm for Art Prof, you totally made my day! Keep us posted on your progress!! You’re so sweet Gail! Thank you for your comment, I was so happy I was the one that got to review your piece. 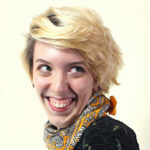 :] I’m glad you’re already so familiar with Hokusai, and also work with printmaking. Have you tried doing a linocut or stamp from one of your brush drawings? I’ve done a few and I’m so in love with the combination of the free flowing brush translated into the exactitude of a carved out image. 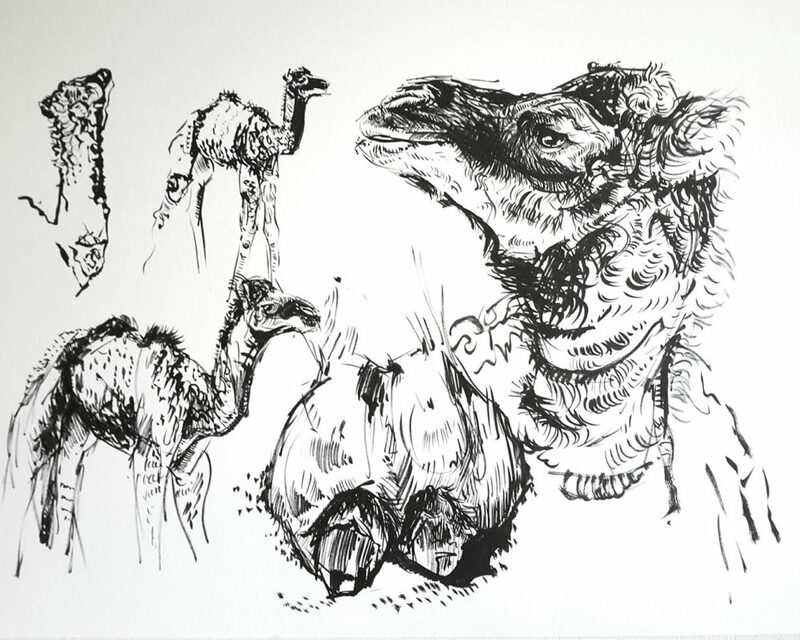 It’s so great to hear that you are creating these drawings based on your visits to local camel farm. So often I see people finding photos of animals online to draw from, which just cannot compare to actually seeing animals in real life and getting the full sensory experience! You’ve got a great command of marks, I like that in some areas you layer your marks quite densely, and then in other areas, the marks are quite sparse and transform into more abstract marks. I would love to see you push that contrast even further; maybe you could experiment with deliberately letting yourself get lost in the marks and let the image of the camel become less and less recognizable. That area that Lauryn pointed out in the video where the marks break down into abstract strokes is really exciting! Keep going, these are fantastic sketches! The energy and variety of your mark making is wonderful! It works really well with the medium and subject matter you’ve chosen. Lauren’s suggestion of trying out various pens and using them together is great! I’d love to see what you could do combining a really fine tip pen with the technique you already have going on here. That might be a great way to add on some really precise details in some areas! It would be great to see you continue to work with camels, and sketch them from life! 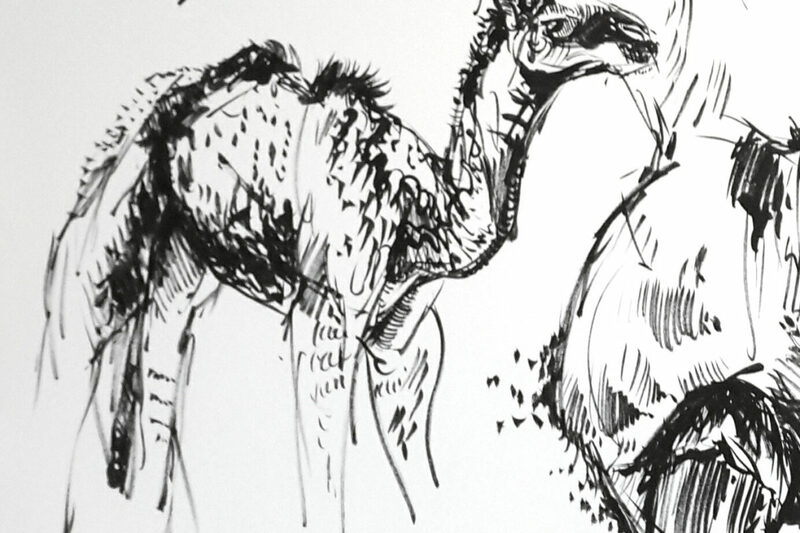 Especially since you do a lot of observational drawing as it is, I would love to see how you interpret camels while having a live one in front of you. The way the wind effects their fur and eyelashes, how their mouth moves while they eat, or a closer look at their funky proportions could all be really inspirational!